Giles Deacon + Jeremy Deller works in the windows of Selfridges. Photographer: Rob Harper. 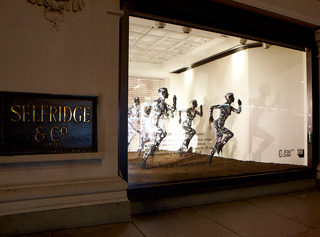 A Britain Creates installation took place in Selfridges 'Wonder Windows' programme. From 31st July - 19th August, the Britain Creates works were displayed in store, following the exhibition at the V&A. This formed part of the London 2012 Festival, a celebration of cultural excellence timed to coincide with the sporting achievements of the Olympics and Paralympics. Visitors were able to buy the official book, including posters of the works, in Selfridges' Concept Store.